For a long time I had not known that this was a COLOUR film because it used to be shown on TV in the pre-colour days but when I did I realised just how good it looked in glorious Technicolor. Even so it is a cracking good adventure film. One of the lasting images from this film is this one below. If ever I think of cinema at its best I think of this scene. It is iconic. It has been used in advertisements too. 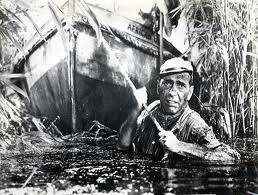 Humphrey Bogart pulls the African Queen through the marshes – above – I love this shot !! 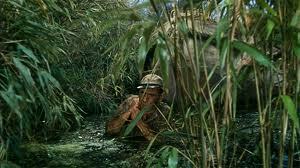 Although filming was generally done in Africa, this scene was a studio set at the Isleworth Studios and in fact there were some shots done on the river at the studios. 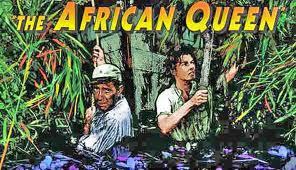 In 1951, shortly before the studios closed for good, much of The African Queen was filmed there. Even so for a film made in 1951, there’s a surprising amount of location filming out in Africa even though much of the African jungle was recreated at Worton Hall Studios, Worton Road in Isleworth, southwest London. The site is now an Industrial Estate. The interior of Robert Morley’s ‘First Methodist Church at Kungdu’ was built here in the studio grounds, to match an exterior constructed in Africa and when called for in Africa a double stands in for Robert Morley, who never left England. He was probably too busy in the theatre for this to happen. The above scenes in the film clip are just after the African Queen had come through the waterfalls, and with great relief at their survival the two embrace one another. Although they didn’t realise it by this time, they had already fallen in love. 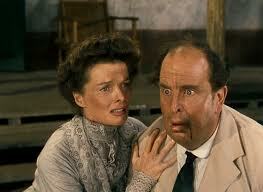 There were certainly more adventures for the two of them though before the film reaches its conclusion. 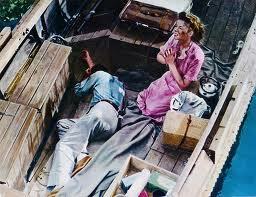 One particularly moving moment in the film is , when they appear to have lost the fight to pull the African Queen through the reeds and are utterly exhausted, Rosie kneels down in the boat while Charlie Allnutt sleeps, and she prays for forgiveness and asks that despite her sins the gates of heaven would be open for her and Charlie. As we know though they survive and the rains come and eventually float the boat and then they can reach the lake – and indeed they do. As they both are utterly exhausted Rosie prays – Above. 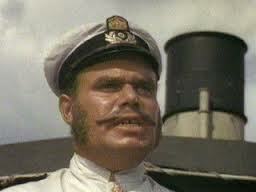 When the two of them are captured by the Germans and are on the boat on the lake, the captain of the Louisa is played by British character actor Peter Bull. He was the son of a famous MP of the time and his acting career took in varied films – one of which is this one. 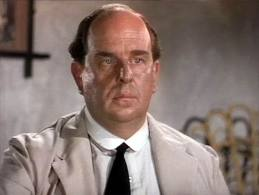 Apparently he was a good friend of Alec Guiness because they had served together in the war. I thought I remembered him in an Alice In Wonderland film and in fact he played The Duchess in the 1972 version with Fiona Fullerton among a distinguished cast. In charge of the colour photography on The African Queen was none other than the legendary Jack Cardiff who was almost universally considered one of the greatest cinematographers of all time. Jack Cardiff was also a notable Film Director. 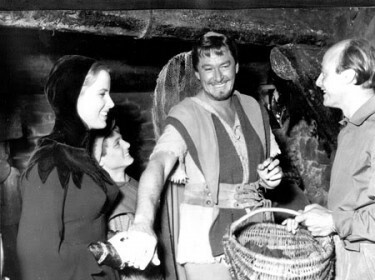 In fact it was Errol Flynn who turned to him to direct The Story of William Tell in 1953. This is a well known story of the Cinemascope production getting under way in Italy and about 30 minutes of the film being completed when Errol who was financing the film himself ran out of money and was unable to raise more – so the film was never completed. I understand that the 30 minutes or so are safe and a friend of mine who is a big Errol Flynn fan has actually got a copy of it. 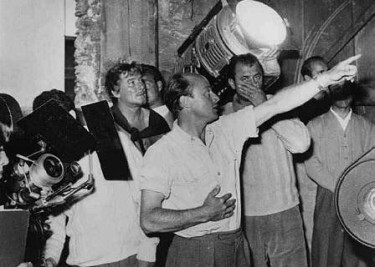 When making the ill-fated William Tell with an excited Jack Cardiff as director and cinematographer on the CinemaScope movie in Europe in the early ’50s. Flynn put up half the money for the movie amounting to around 450,000 US Dollars and he had also persuaded the Italian govt. into giving him a further 145,000 dollars on top of that as well as an incentive to boost the postwar Italian economy. When the financing fell through on William Tell due to some questionable bookkeeping from some of the Italian money men, a heartbroken Flynn had to abandon the project–even after he had advanced more of his own cash to keep the project afloat. It does make you think that a film man like Errol Flynn was probably out of his depth in the financing department and you would have thought that with the backing maybe of a big studio he could have pulled it off and given us a cracking good Adventure film in Cinemascope and Techicolor – and in those days that was big plus.